Note that we were able to review the Hyundai Elantra and new Honda Civic, so I’m planning to publish a comparison later this month. 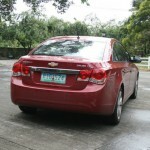 The Chevy Cruze is not the kind of car that Filipino drivers are used to. 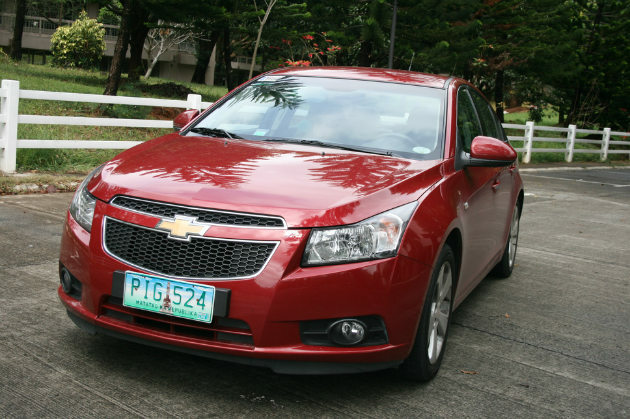 Compared with subcompact sedans and AUVs — which are the bestsellers in this market — the Chevy Cruze has much to offer in terms of trim and features. 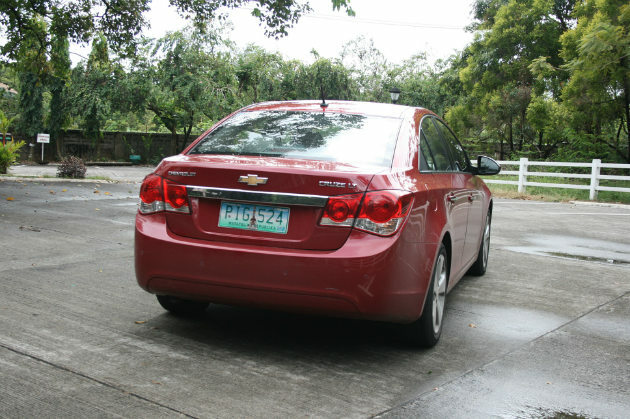 The American brand’s design and tuning are more apt for highway driving than your usual congested Manila routes, and you might find yourself out of place in busy roads. 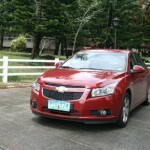 The highway is where the Cruze is more comfortable, being better-built for cruising and longer-distance drives. The LT is Chevy’s top of the line gasoline model. 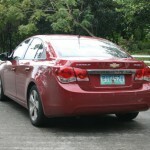 Priced at PhP 1.1 million, the Cruze competes directly against the Toyota Corolla Altis 2.0 V and the new Honda Civic 1.8 EXi. 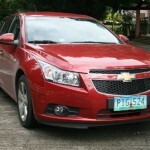 Chevy advertises the Cruze to deliver 141 PS output at 6,300 RPM. Mated with a 6-speed automatic transmission, the car is rated at 11.5 seconds in accelerating from 0 to 100 Km/h. In real-world tests, we found the Cruze to be quite the laggard when starting on city roads, especially during stop-go traffic. 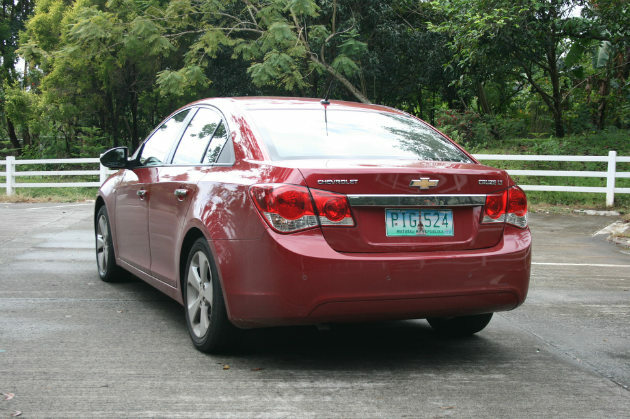 On the highway, though, the Cruze cruises well, and accelerates quickly from 60 to 100 Km/h, which means the car performs adequately in highway overtaking. 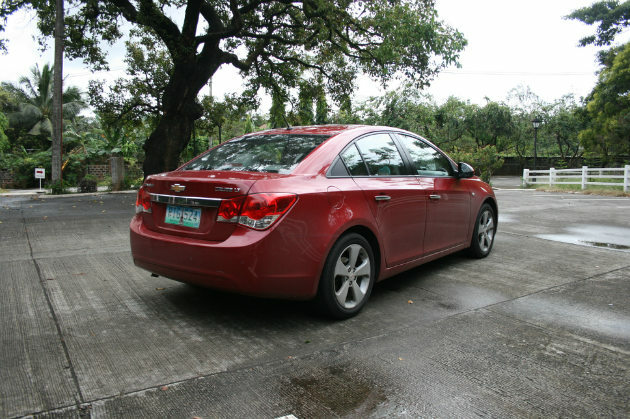 The Cruze feels a bit on the heavy side at slow speeds, although it handles well when cornering and when traversing winding, hilly roads. Chevy says the suspension setup is tuned for symmetry, which should make the driving experience acceptable (if not fun) for hard driving. 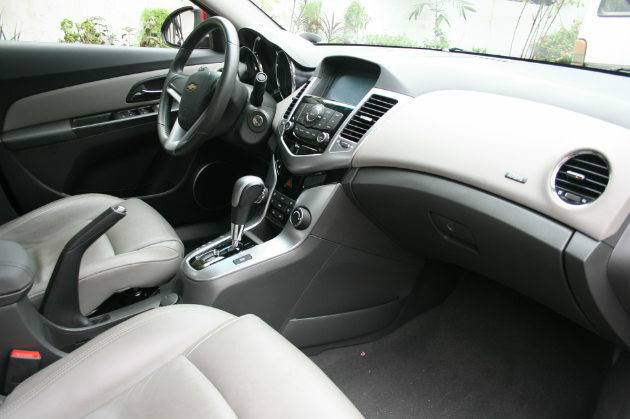 For those who want to take shifting into their own hands (literally), the Cruze features a semi-automatic shifter that can be accessed by pulling the shift lever outside the gate to access the + and – selectors. Manual shifting does have a bit of a lag, though. 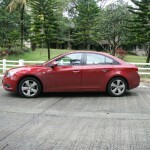 In terms of mileage, the Cruze is a bit on the low side. We tested an average of 8 Km/L, with about 6 to 7 Km/L city and 12 Km/L highway. 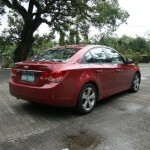 Even with adequate handling, the Cruze is not a Honda Civic or Subaru Impreza. 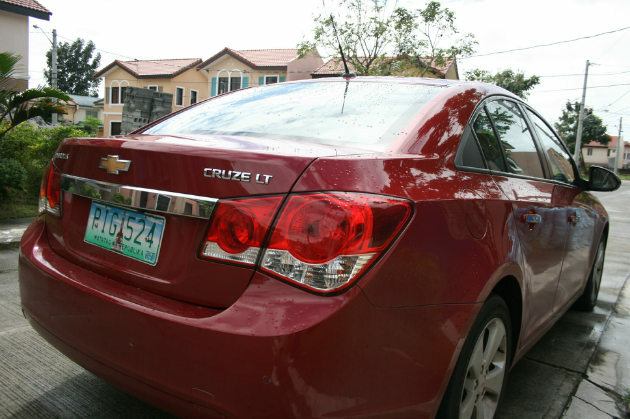 People who buy the Cruze would probably go for its comfort, space and features, and here’s where the Cruze does not disappoint. 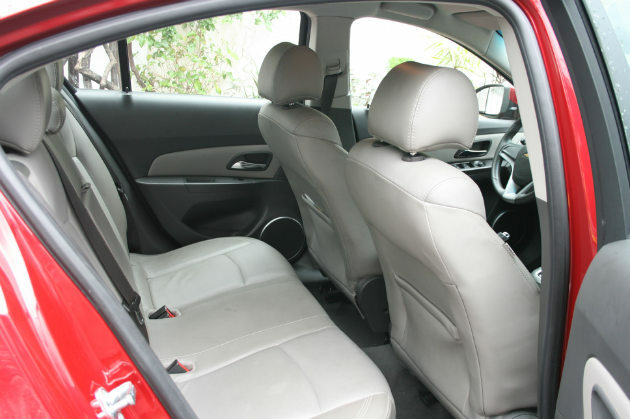 The interior provides adequate space and legroom, especially at the rear seats. 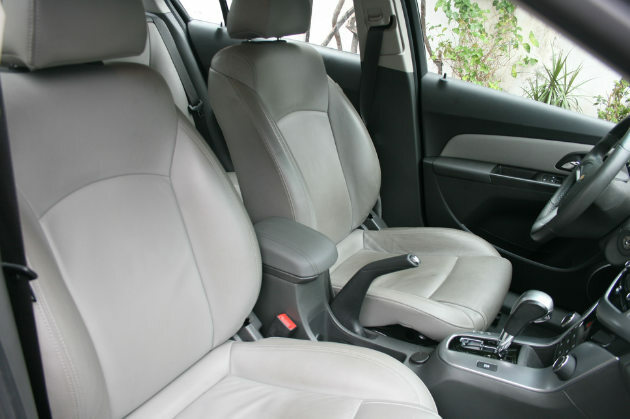 The leather seats and leather-wrapped steering wheel scream refinement, and you would feel like you’re in the cockpit of a more expensive luxury sedan driving the Cruze. The driver gets the best view, of course, with the instrument cluster, which is composed of twin analogue gauges showing the tachometer and speedometer. There’s an LCD screen in at the center, which shows the mileage computer, trip meter and current gear. 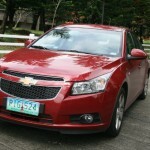 In terms of nooks and crannies to keep those smartphones, tablets and other gadgets, the Cruze has much to offer. The glove compartment is a bit on the small side (the Nissan Teana probably has the biggest glove box we’ve seen in a sedan), although the box does contain device ports, like an iPod charger/connector and a USB slot. 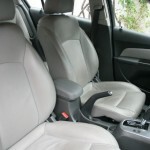 The dashboard has an extra console compartment at the center, and the front seat backrests have the usual pockets for holding document folders or gadgets. You also get two adjustable cupholders at the front, near the handbrake lever, and two at the rear seat’s folding center arm rest. 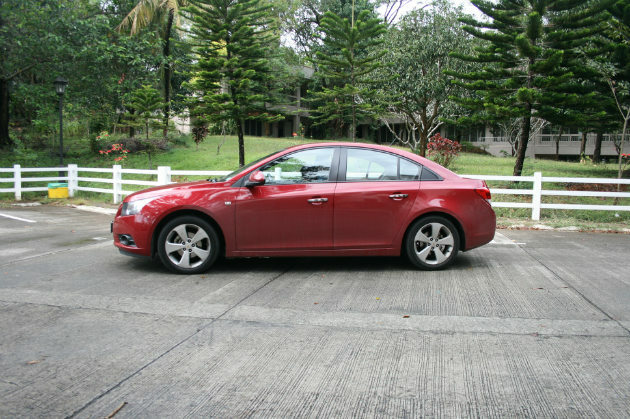 The Cruze does well for a family car with its safety features and space. The LCD screen smack at the middle of the dashboard serves as a multi-function display, through which driver or passenger can choose music tracks from the CD or media player, change car settings (such as alarm sounds, automatic door locks, lights and whatnot). When you shift to reverse, the LCD offers a closed-circuit camera display of the rear, for added safety while parking and backing up. 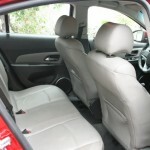 The rear seats also fold down, with a 60-40 split, for accommodating long items. The boot is a bit shallow, though, so while you can carry wide and long items, you would have a difficult time loading tall gear and boxes. 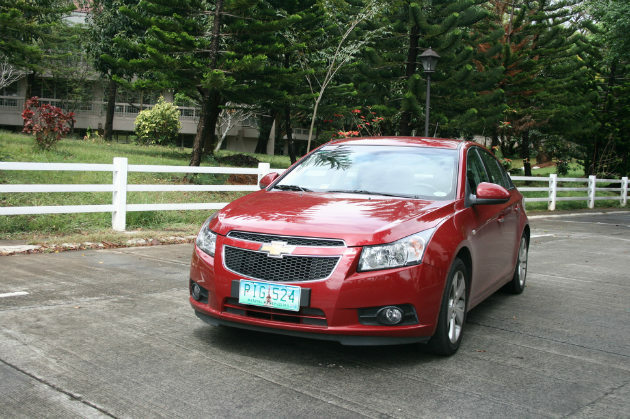 In terms of safety, the Cruze offers ABS, electronic brakeforce distribution (EBD), and stability control, which would help with improved control during difficult situations that require sudden braking. 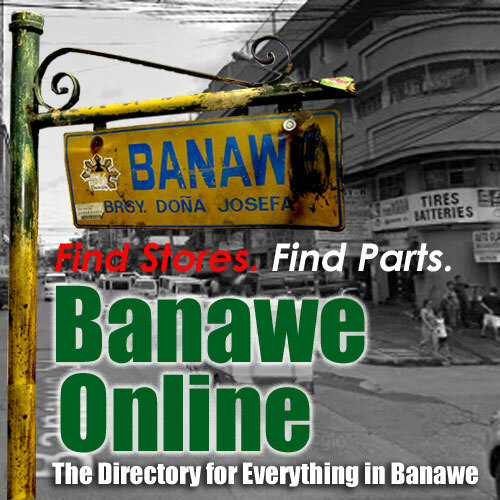 At the end of the day, you would have to ask yourself if this is a car you would buy for keeps. 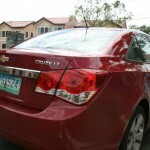 The Chevy Cruze certainly has tough competition in this price range, such as the Altis, Civic, Elantra, which are more numerous in Philippine streets today compared with the Cruze. 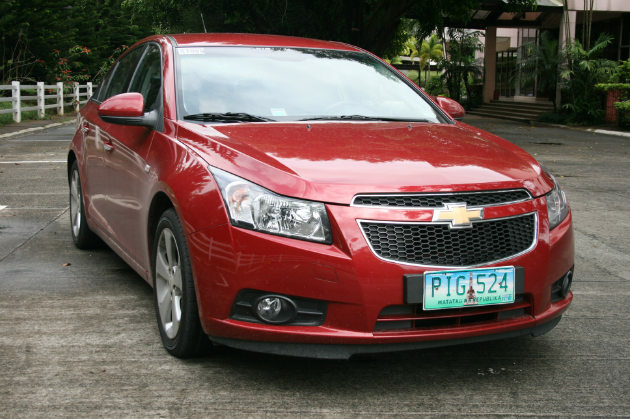 But, compared with the competition, the Chevy Cruze seems to offer more luxury for the price, and here’s where Chevy has hit the sweet spot with its target market.